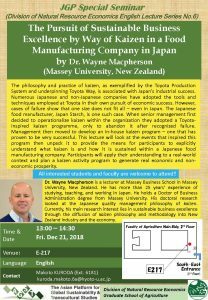 On the 21st of December 2018, as part of the Japan Gateway: Kyoto University Top Global Program (JGP), the Division of Natural Resource Economics will be holding a special seminar entitled “The Pursuit of Sustainable Business Excellence by Way of Kaizen in a Food Manufacturing Company in Japan” presented by Dr. Wayne Macpherson from Massey Business School in Massey University, New Zealand. All interested students and faculty are welcome to attend. No registration is required.